These look great and were very easy to install! Del Hutson Designs Rustic Luxe Stemware Shelf Set, 36"
Show off your fancy wine collection and be ready to pour a glass on the fly with this useful and unique set of three floating wine shelves. 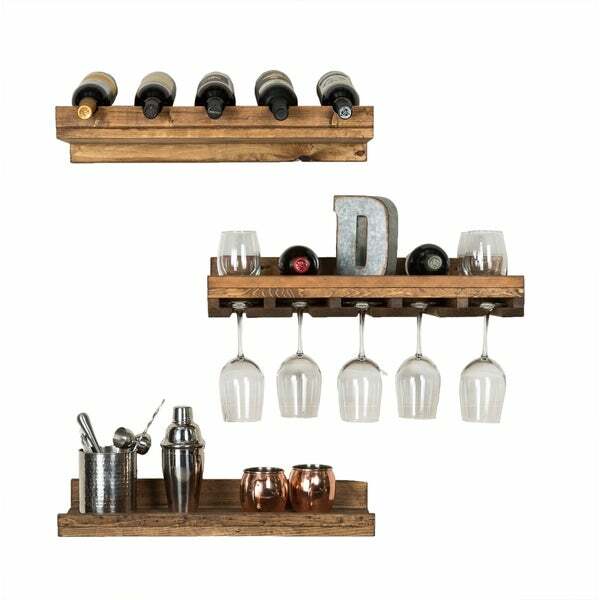 Beautifully handcrafted of solid with a walnut finish, this set includes a wine rack shelf, a shelf for hanging up to 15 wine glasses, and a third shelf for additional bottles, supplies, or whatever your heart desires. I am in love with these! The quality is wonderful. 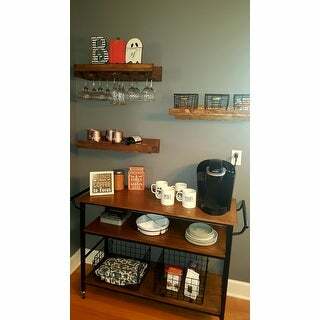 I also bought the Del Hutson Designs Reclaimed Wood Coffee Shelf. The colors aren't exactly the same, but I think they will work hung on the same wall. I haven't tried to hang these up yet, but hardware and instructions were included for hanging. Product is as described. The size and color is true to description and was very easy to hang! It hold 10 wine glasses easily and 5 bottles of wine. Decent shelf space and can hold a quite a bit of weight. Good Quality and easy to install! It fits 20 wine glasses comfortably, and holds the weight of bottles of wine as well as baking containers full of flour and such without a problem. We took them to our next apartment and they were super easy to uninstall and reinstall in the new place. Highly recommend! Item was damaged. The wood was cracked. Two out of the three shelves had cracks in the wood. It is a real wood item and the wood was completely split making it unable to be hung. Had any weight and placed on the shelves it would have fallen off the wall. 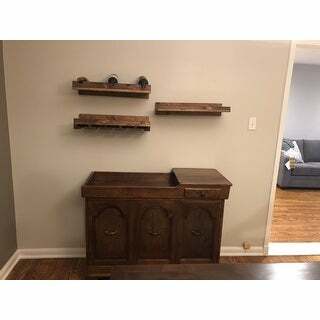 Wine bottle shelf too short for most wine bottles. Love the look and feel of the shelves. However, I don’t know if I would trust the wine bottle holder shelf to actually hold 5 bottles. I currently have 3 on it and can see it dip down some. Other than that, I love it! Very nice and different from having a wine bar. Lots of space. Easy to put up. Easy to decorate. Love it. Was skeptical but in the end it worked out. The color is also very nice and rustic. Beautiful wood and strong shelves. These are going in our lil bar under our stairs. My husband is so happy with them!!!! Would totally recommend!!! good for the price although it doesn't seem to secure to be honest. will probably have to remove a few bottles off the shelf. It’s perfect! Exactly what I wanted. I love it! I had to paint them to match my cabinets. Now they fit in seamlessly and look awesome. It's exactly what I wanted! "Do these come with the hardware necessary to hang them"
Yes, this will come with 6 screws and 6 drywall anchors to install these shelves. "What is the width of the slots for the wine glasses. I have mikasa glasses that have a wider, fluted stem and I need to make sure these will slide into the rack. Thanks!" Del Hutson Designs Rustic Luxe Stemware Shelf, 36"
Del Hutson Designs Rustic Luxe Wine Set, 24"